Super Nintendo Entertainment System, 1994. This game is sealed and appears as new. Please read the information below. 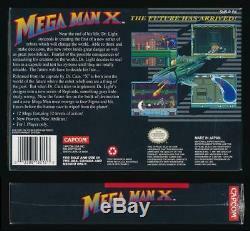 Mega Man X (Super Nintendo Entertainment System SNES, 1994) Mint Sealed Complete. About Video Sanctum: Video Sanctum LLC deals primarily with analog media and out of print horror and exploitation film. We specialize in VHS, Betamax, Laserdisc, and other forms of non-digital media. To this end, several years ago we discovered two boxes of Super Nintendo cartridges after purchasing the remaining inventory from Houston's oldest and longest running independent video store, Audio/Video Plus. We are aware that these games are not considered "factory sealed" by most collectors without the "H Seam" present on the shrink wrap. That being said, we have done our best to outline what we know about the SNES games and present that here for you to decide. About Audio/Video Plus: Audio/Video Plus opened in Houston in 1979 as a rental and retail outlet for the new home video market. Part of Video Sanctum's mission is to preserve the history of this legendary establishment through maintaining its archives and reporting on its historical transformation over three decades as the store remained open for business until 2012. 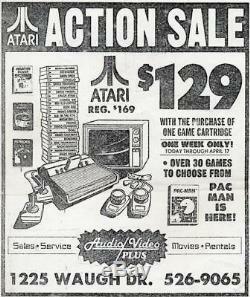 In addition to providing all things home video, Audio/Video Plus was an enterprising video game retailer and rental shop as this market grew at around the same time as home video. 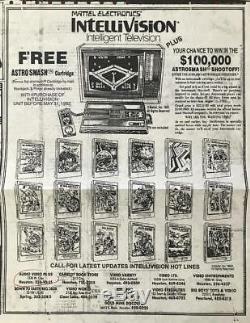 We've added a few archival newsprint ads from the early 1980s showing Audio/Video Plus's role in supporting early gaming systems such as Atari and Intellivision. This SNES game was part of two boxes (around 80 games total) that were buried over time and unearthed as we moved the inventory to a new location. It is reasonable to assume these items are new and sealed, but without the H-seam present our research has shown they shouldn't be marketed as such. About these games: Please note, we do not claim any specific knowledge regarding retro games. Our expertise lies solely within home video formats, posters, promotional items, and other film related merchandise. For retro gaming, we have pieced together what we know from collectors in our network, other sellers online, and a variety of helpful forums and websites. We have handled this lot of SNES games since acquiring them in 2015 and have opened and inspected more than two dozen of the original games and then listing them as CIB. Initially, we considered having these graded but over time we've decided these belong with collectors who will have more knowledge on the games themselves. What we know: Of the two dozen games we've opened so far, all of them were complete in the box and contained the normal inserts, manuals, promotional inserts, maps and other booklets where appropriate. All of the boxes showed no crinkling or wear on the hinges before being opened by us, which implicates they have never been opened (not resealed). The games all tested to work and showed no signs of normal wear, appearing bright and unused (as new). What we don't know: Honestly, the only flaw we've identified is the lack of an "H-seam" on the seal for these games. All of the games sealed with three-seems and some include breather holes in the wrap. Any item specific condition points will be listed below. This SNES game is bright and clean with no fading or wear. The box is mint with no crushing or dings. The shrink wrap is sealed (no H-Seam aka Vertical seam). Seam slightly separated on right end of box. Please lock us in on your favorites as we'll be listing the remainder of our SNES stock in the coming weeks. Auctions can be paid after the final listing has ended. TERMS: Our terms are straightforward: satisfaction guaranteed. Thank you for checking us out. ABOUT VIDEO SANCTUM: Founded in 2010 and based in Houston, Texas, Video Sanctum is an international video retailer specializing in obscure, factory-sealed and out-of-print horror and exploitation films on analog media formats. Video Sanctum is owned and operated by video collectors who value the historical significance of genre film and medianing the pre-digital era. We are proud to deliver quality VHS/Beta cassette tapes and other retro items to dedicated fans of HORROR, EXPLOITATION, SCI-FI and CULT films. Be sure to out the Video Sanctum store. Most video titles are categorized by distributor. Thank you for checking out Video Sanctum! Get Supersized Images & Free Image Hosting. Create your brand with Auctiva's. Attention Sellers - Get Templates Image Hosting, Scheduling at Auctiva. 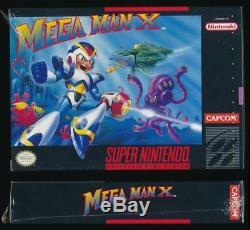 The item "Mega Man X (Super Nintendo Entertainment System SNES, 1994) Mint Sealed Complete" is in sale since Wednesday, October 31, 2018. This item is in the category "Video Games & Consoles\Video Games". The seller is "videosanctum" and is located in Houston, Texas. This item can be shipped worldwide.